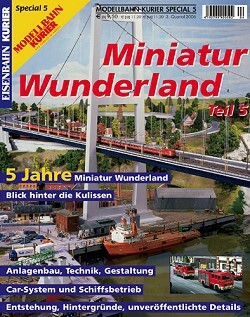 To commemorate this anniversary, the 5th Modellbahn-Kurier Special about the world's largest model railroad layout in Hamburg's historic Speicherstadt was released. For the first time no new building section is introduced; instead, we look behind the scenes, report about technical issues, building methods, and detailing. 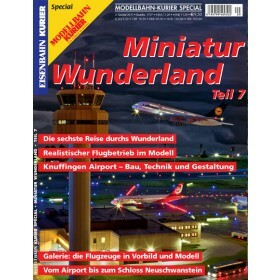 The history of the Wunderland is viewed from various perspectives. Other chapters cover not yet published (and for visitors partly invisible) details. The cahnges and development of the existing building sections over the years is also documentated. Further topics deal with the Car-System and the ship-control. 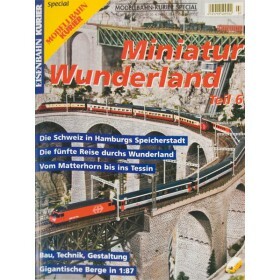 An, indeed, special Modellbahn-Kurier Special: informative for every model railroader and a true bonanza for a Wunderland fan.